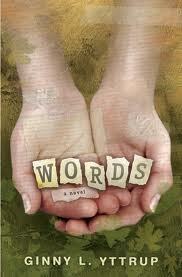 I mentioned in my last post that I was reading Words by Ginny L. Yttrup. Don't ask me how to pronounce it. I don't know. But I have finished the book. I didn't want to write about this book. I wanted to read a book for enjoyment and not have to think and take notes. You'll wonder at my choice in a moment. I knew I wanted to read this book before it came out. It sounded so intriguing. But I must admit though I had my doubts about the painful storyline. Words is mainly told from two perspectives. It starts with Kaylee, a ten-year old girl, abandoned by her mother and sexually abused by the boyfriend she left behind with her child. Yeah, tough stuff. To escape her horrible reality, she reads and collects words. Due to the trauma she has endured, though, she stops speaking, so those words remain confined to her mind and paper. The second perspective is Sierra's, a woman who is holding onto the pain of being responsible for the death of her baby daughter 12 years earlier. As predicted, their lives connect and they eventually both find freedom in Christ and healing from their past. Although the plot seemed a little far-fetched at times, I really enjoyed this book because of how the author dealt with such a painful subject. Many books that deal with similar topics often contain graphic detail and cause your stomach to churn. I like detail, and sometimes it's necessary, but not too much in these cases. The most graphic details in the book were related to drug abuse. How does an author write a book about abuse and effectively connect with the reader without being graphic? Easy. Tell the story from the abused child's perspective. A child who is alone, scared, embarrassed, ashamed, and thinks it's her fault. A child who refuses to tell anyone, or should I say, write it for anyone. A child who wonders if she's a whore. A child who will only elude to what's happening to her and shares with the reader how it affects her. That tugs at the reader enough without graphic details. In the back of the book, we also learn that the author wrote this book out of personal experience and now helps women suffering trauma from sexual abuse. She knows. She understand what victims suffer and makes her the perfect candidate to write such a story. I've read some great books and I enjoy detail, but when dealing with such difficult issues, you can do without and still write a great story. In some cases, details become necessary, but not always. Writers can connect with me without having to make me sick.